Have you ever thought about joining the Knights, but didn’t have a chance to catch up with one of us to learn how? Well now you can do it right from your phone, tablet or computer! 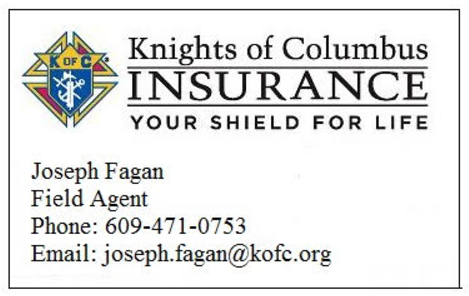 The Knights of Columbus have opened up a registration website where you can learn about what the Knights do, where we’re located, and even join right on-line! After that, you’ll be put in touch with a council in your area. We were very happy to take part in the fourth annual Assumption 3397 8th Grade Spelling Bee at St Michael The Archangel Regional School today as they kicked off Catholic Schools Week. Congratulations to our finalists – Natalie Mancus, third place; Christopher Jasinski, second place; and Christian Bracht, first place! Each was awarded a certificate and a Wawa gift card. Many thanks to Deputy Grand Knight Mike Walsh, Recorder Doug Miedel (not pictured) and future Columbian Squire and current 4th grader Jack Walsh, who helped moderate and judge the event. For the third year in a row, we were proud to be able to hold our Annual Spelling Bee at Saint Michael the Archangel Regional School in Clayton. The event coincides with the Diocese of Camden’s Catholic Schools Week. The 8th graders were great sports, cheered on by the 5th, 6th, and 7th grades. Congratulations to our winners: 1st Place Nathan Scott, 2nd Place Zoe Gaudio, and 3rd Place Giselle Williams. A special thank you to our volunteers, Deputy Grand Knight SK Mike Walsh (MC), Financial Secretary Raymond Iacovone (Sentence reader), Recorder Doug Miedel (Tiny dictionary definition reader) and Grand Knight SK Jim Cosgrove (Timekeeper).